Serendipity, expertise, foresight and the equivalent of an Earth observation data archaeological dig have led to recovery of almost-40-year-old satellite imagery – thought lost forever – which will significantly add to understanding of our planet’s climate. To say that the discovery of this lost data was greeted with enthusiasm would be an understatement, with climate scientists describing it as “like finding a lost child” – “the first born”! Meteosat-1 was launched on 23 November 1977, and was positioned in a geostationary orbit at 0° degrees longitude, with a constant view of most of Europe, all of Africa, the Middle East and part of South America. From that position, this view of the “full-disk” was scanned every 30 minutes, with the data being provided in near-real time to users. The satellite’s mission lasted until 25 November 1979. 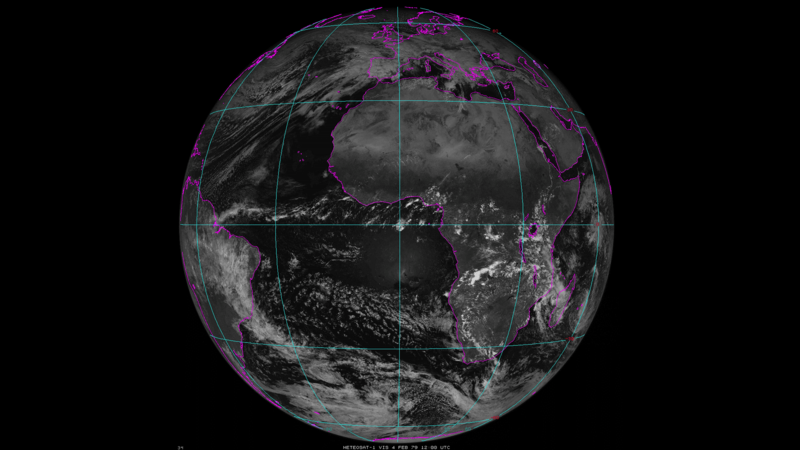 Meteosat-1 represented cutting-edge technology for its time, introducing the concept of a global system of geostationary platforms capable of observing the atmospheric circulation and weather around the equator in near-real time. It was also the first geostationary meteorological satellite to have a water vapour channel, tracking the motion of moisture in the air. The data found in America comprises 20,790 images, from 1 December 1978 to 24 November 1979. On 27 June 2016, EUMETSAT held an event to celebrate its 30th anniversary, in Darmstadt, Germany. Among the guests was Dr Paul Menzel, Senior Scientist with the Cooperative Institute for Meteorological Satellite Studies, part of the University of Wisconsin-Madison’s Space Science and Engineering Center. A memento guests at the event received was a memory stick with links to EUMETSAT’s climate data record, from 1 January 1984 up until the anniversary in 2016 – more than 32 years. “It was pointed out that the data was all there, except for two days, which were missing,” Dr Menzel said. The SSEC Data Center didn’t have the data for the missing two days but did find something even more valuable. In 1978-79, the First GARP (Global Atmospheric Research Programme) Global Experiment (FGGE) was undertaken – a project reported by New Scientist at the time as the biggest cooperative international venture ever undertaken. Its aim was to find out which gaps in global weather monitoring could be filled to improve weather forecasting seven to 10 days in advance. Meteosat-1 data was provided to the SSEC for this project. The centre’s founder, Verner Suomi, often referred to as the “Father of Satellite Meteorology”, had the foresight to recognise the importance of preserving Earth observation data. Dr Menzel’s colleague, CIMSS Programme Manager Dr David Santek said teams of experts had worked in three shifts around the clock tracking cloud features in the images from the 1,200 nine-track tapes of Meteosat-1 data that was shipped to them for the FGGE project in 1978-79. “Then those tapes sat around for 20 years,” Dr Santek said. “In 1997, we started converting data from old tape media on to more modern media. We could not dispose of those old tapes. “From 2001-2004, new nine-track tape drives were acquired to extract most of the data from the tapes and, over the past 15 years, the original data were stored on disk, although, without any attempt to use it. That’s why the old data were able to be found. But finding the data was not the end of the story. The files were stored on disk in the original tape format and needed to be decoded. Dan Forrest, SSEC’s Senior Systems Engineer, spent several weeks piecing the files together, dug up old documentation, wrote a decoder and was able to retrieve the data, but it was not quite usable. In another serendipitous twist, Dr Santek was the person who wrote some of the original code and he provided modules for navigating and calibrating the data. The data from Meteosat-1 will help scientists better understand the climate and how it has changed. EUMETSAT Climate Services and Product Manager Dr Jörg Schulz, said the discovery would not only provide a longer time series of climate data but would be reanalysed and reprocessed using the latest methodology. “It gives us information about the state of the Earth’s atmosphere from a time when there was less interference from human activity,” Dr Menzel added. Dr Schulz said this would help further improve understanding of the Earth’s climate system. “One of the grand challenges in climate science is to better understand atmospheric circulation in general,” Dr Schulz said. “Where is the tropical, warm, moist air going? Where is the polar, cool, dry air going? And how does this change over time? The three scientists were keen to stress not only the scientific and historical importance of the data but also how this demonstrates the value of strong collaboration and cooperation. “It’s another example of the strong collaboration between SSEC and EUMETSAT and I’m very happy to have found those tapes,” Dr Menzel said. “We are excited about the work done at SSEC and look forward to analysing and improving the data in collaboration with SSEC in the coming years,” Dr Schulz concluded.